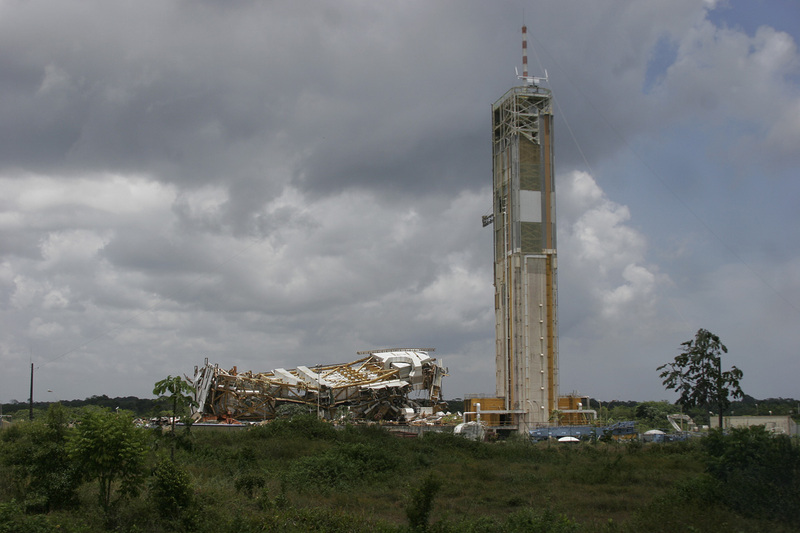 KOUROU, French Guiana -- A mothballed launch pad for the acclaimed Ariane rocket family is being dismantled in South America after supporting 119 space missions for scientific and commercial customers. 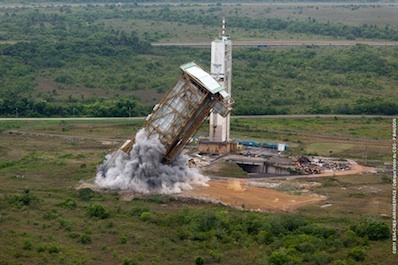 Engineers are demolishing the Guiana Space Center's ELA-2 launch site as the spaceport undergoes a modernization to host three different types of launchers beginning this year. 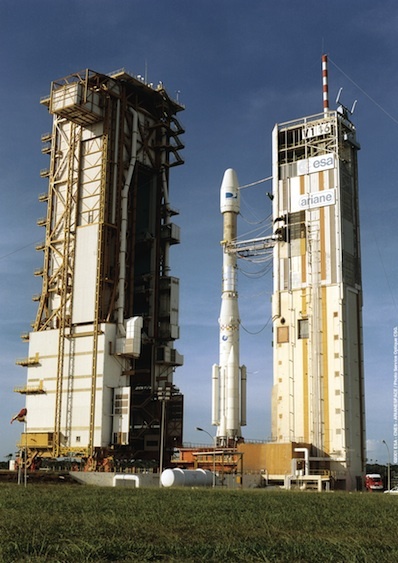 ELA-2, which stands for Ensemble de Lancement Ariane-2, was the home of the Ariane 4 rocket from 1988 until it was retired in 2003. ELA-2 was also the site of several launches of the preceding Ariane 2 and Ariane 3 vehicles in the 1980s. Dismantling of the launch pad began in July, and explosives brought down the 26-story mobile service gantry in September. The dramatic toppling changed the landscape of the space center, which is nestled near the Atlantic Ocean at the edge of the Amazon rainforest. Launch pads for the Ariane 5 and Vega rockets are less than a mile away from the ELA-2 complex, so it's important to manage the facility's destruction without impeding current launch operations. When it saw its first launch in 1986, the ELA-2 pad was a modern complex that permitted a more rapid pace of flights from the French Guiana spaceport. Instead of assembling rockets in place on the launch pad, the ELA-2 design allowed vehicles to be integrated in a separate building, then rolled to the pad to receive payloads. The final launch from ELA-2 was the last flight of the Ariane 4 rocket in February 2003. The mobile gantry brought down last month featured access platforms for workers to reach various levels of the rocket, including an area near the top to attach satellites to the launcher. In the hours before blastoff, the gantry was rolled back to reveal the rocket. With the remnants of the tower now crumpled on the ground, workers are cutting up the metal and shipping it to Europe for recycling and disposal, according to Arianespace, the commercial operator of the Ariane rocket family. The metallic structure of the pad's fixed umbilical tower will be dismantled by the end of the year, leaving the facility's concrete base bare and ready for use in future programs. CNES, the French space agency, is overseeing the demolition effort under a mandate from the European Space Agency. CNES operates the Guiana Space Center, which is owned by ESA. Other ELA-2 infrastructure is being used by the Ariane 5 and Soyuz rocket programs. The Soyuz launch pad is located a few miles northwest of the ELA-2 zone, but a former Ariane building is now housing processing and fueling of the Soyuz rocket's Fregat upper stage. The first Soyuz launch is set for Oct. 20, while the solid-fueled Vega launcher will debut in early 2012.